Enjoy spectacular alpine views whilst indulging in fresh, local delicacies prepared by our chefs, in the stunning Canterbury high country. Perfect for a relaxed taste of the High Country, views over the golf course to Mt Hutt may be enjoyed either from the fireside or on the deck. We offer a tasty variety of meals and snacks. The cafe is open for in-house guests and travelers alike for breakfast, lunch, snacks or a leisurely drink, daily from 8am. Sundays are special with additional lunch dining options. We welcome families with children to visit the resort and can provide high chairs, coloring pages and pens and toys if desired. We also provide a children’s menu and can accommodate individual needs. Please just ask our friendly staff for assistance if you require anything. *Please note, menu’s are subject to availability and may be different during your visit. You are welcome to call and confirm. There is a 15% surcharge applicable on Public Holidays and 1.5% surcharge for credit cards. A large open fire, leather sofas and warm natural tones enhance this already special dining location. We welcome families with children to visit the resort and can provide high chairs, colouring pages and pens and toys if desired. We also provide a children’s menu and can accommodate individual needs. Please just ask our friendly staff for assistance if you require anything. Special dinner bookings for exclusive hire are available, please enquire at events@terracedowns.co.nz. 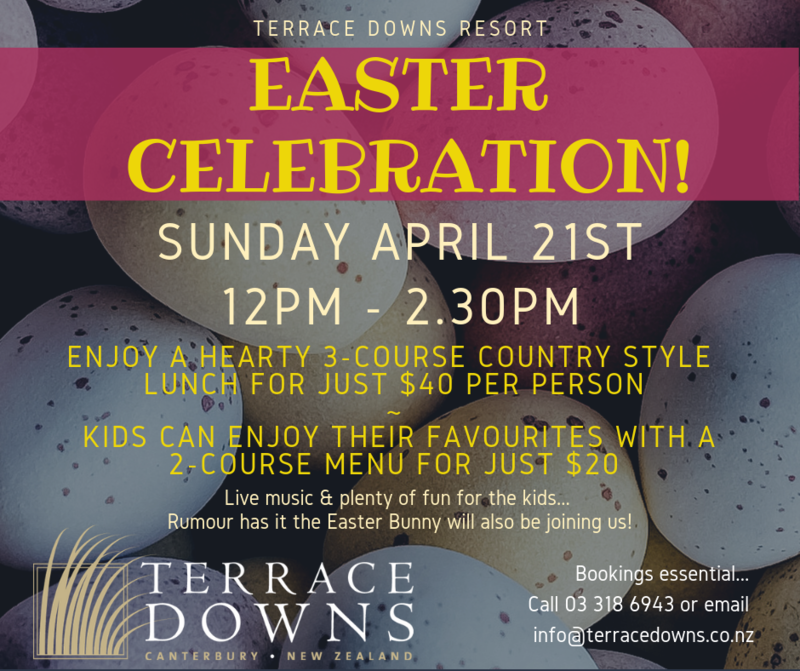 Please phone +64 (0)3 318 6943 to make your reservation or email info@terracedowns.co.nz. We have changed our scheduled Buffet lunch for Easter Sunday to provide a more fun experience the whole family can enjoy! Enjoy a hearty 3-course country style lunch for just $40 per person. Kids 12 years and under can enjoy their favourites in a 2 course menu for just $20 each. There will be live Music for the adults, whilst the kids can enjoy fun activities. Rumour has it the Easter Bunny will also be joining us with heaps of easter eggs to give away! Enjoy a wide array of delicious foods, both classic favourites and exciting new additions. Please contact us on 03 318 6943 to make your reservation (bookings are essential). Please note there is a 1.5% surcharge for credit cards. A Finest Slice of High Country!